You can create static content pages for your site. To manage your pages use the icons under the Manage header. You can view, edit or delete the products. To rearrange the order and the place of your pages use the Menu Editor. To add a new page, go to Pages and click the Add page button to the right. – Content – descriptive and presentation type of content. For example About us, Used materials etc. – Categories – Is a content type page under which you can list your store’s categories. If you select only one category, the products from that one category will be listed. – Link – to other sites you own, social network profiles, your partners’ sites, etc. If you chose a link as your static page add the URL of the website where the link should point to. In case of content type of page please fill the editor. Be sure to use the editor to format text and provide links. 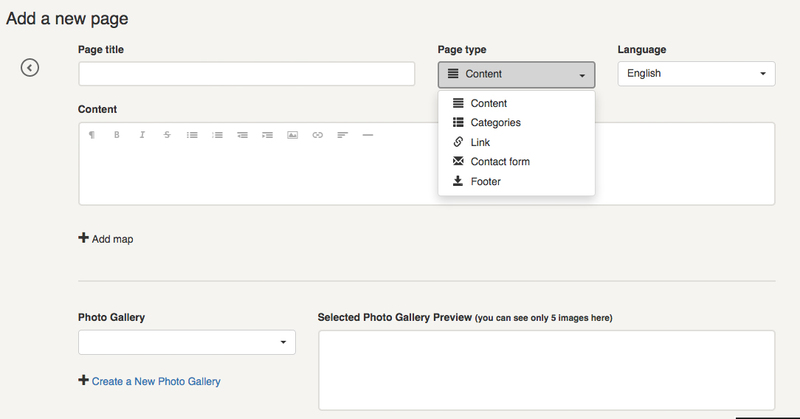 You can also add a Google map to your content type page by clicking the “Add map” link and add the location. Set the status of the page. By adding keywords you can help your customers find your pages.